There’s the crisp smell of autumn in the air, which can only mean one thing: you’re almost too late to register for classes! 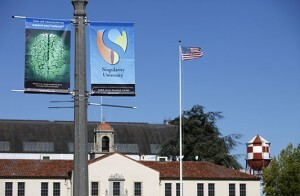 Singularity University is the academic program focused on the exponential growth of technology that just completed it’s inaugural year. Located in the NASA Ames campus, SU’s main summer program allowed its students to explore the companies and innovations of Silicon Valley. A shorter, 9 day executive program is running from November 7th to 15th and will focus on many of the same concepts as the summer session. Registration for the executive program October 20th, so interested candidates should go now to the SU sign up page. Dr. Peter Diamandis, vice-chancellor of Singularity University, discusses the goals and benefits of the 9 day session in a short video after the break. Singularity University’s executive program in November essentially takes a nine week summer course and distills it into just nine days. The aim is to educate business leaders about the possibilities and consequences of exponential growth in technologies. With the knowledge from the course, SU hopes to generate a class of educated executives who will be capable of harnessing the emergent trends of technology to solve humanity’s grand challenges (including hunger, poverty, climate change and energy). Hopefully, those attending the course will be better able to navigate their own companies to profit from exponential growth technologies while simultaneously creating a future where those technologies benefit everyone. As is typical with an executive program, SU’s nine day course doesn’t come cheap. Tuition, room, and board will run you or your business a total of $15,000. While that’s steep for me, it’s pretty cheap for executive programs which usually run around $5k-$10k for a weekend. The nine day course is expected to have less than 40 students, and not everyone who is interested will necessarily qualify. The summer session was a success and produced some interesting ideas: a 3D printer that could produce a house, improved disaster recovery through crowd sourcing, SMS applications in developing countries, and the creation of Gettaround car sharing (which is competing with Zipcar). I’m curious to see what high power business executives can do with their time at Singularity University. While I doubt we will see the depth of projects we did with the summer session (there just isn’t enough time), these students will be at the unique position to reshape their companies upon returning from the class. There could be more change in less time. Which is sort of what exponential growth is all about. *Disclosure: Keith Kleiner (owner of Singularity Hub) is an Associate Founder at Singularity University.